The new Heat Pump Operating Cost Estimator program is here! AquaCal has just converted their valuable heat pump sizing program to an online version. No more downloading the program onto your computer. 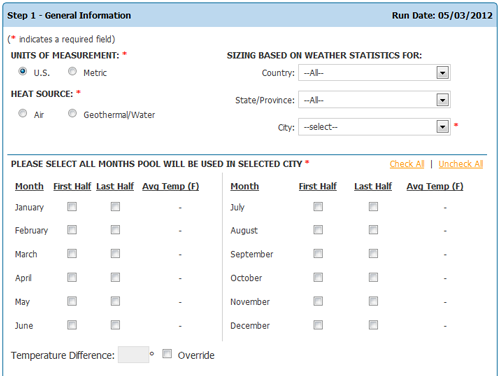 You can run the heat pump cost estimator right from www.aquacal.com. Eliminating compatibility issues with Macs, Windows 7, etc. You can access the Heat Pump Operating Cost Estimator by visiting www.aquacal.com and clicking the link on the right hand side of the website. This is a great selling tool for you, please visit our AquaCal Heat Pump webpage to view the full line of AquaCal heat pumps we offer. If you have any questions about the program or AquaCal please email your Export Manager.